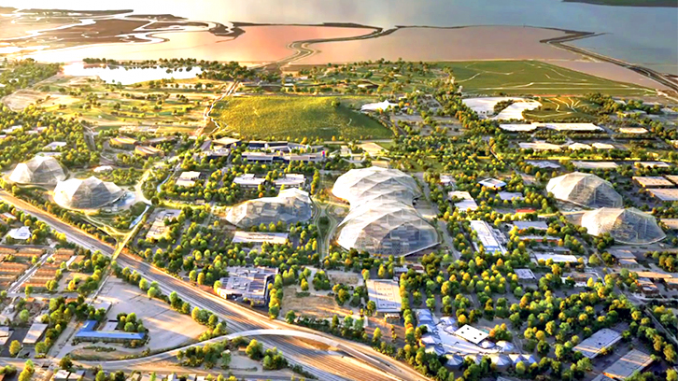 An artist’s rendering of Google’s planned North Bayshore campus in Mountain View. Before a testy exchange with Mountain View City Council members that could cause Google to drop its plans for housing in the North Bayshore area, a Google official outlined the company’s plans to move forward quickly on development there. Joe Van Belleghem, Google’s senior director of design and construction, said the company would be working with the city this year on its plans for the Landings, an 803,000-square-foot office building just north of Highway 101 on Landings Drive. Early next year, Google would present its plans for the Huff project, a 328,000-square-foot office building on Huff Avenue. That would be followed by proposals for a residential project and a mixed use project, also in the North Bayshore area. The mixed use project would include homes, retail and likely a hotel. The idea would be to submit master plans for each development to the city, which once approved would speed the projects’ implementation, Van Belleghem said. Google is also working on a comprehensive plan that will show how each of its projects will work with the others in terms of parking, traffic and other issues. And the company has commissioned a study on how the new development would impact school enrollment. Van Belleghem discussed the projects during the council’s study session last Tuesday on the North Bayshore precise plan. The plan for the 650-acre area includes up to 3.6 million square feet of new office and commercial development and as many as 9,850 housing units. Van Belleghem initially spoke glowingly of the plan’s vision for an “innovative, sustainable, mixed-use community.” But sparks flew later in the meeting when four of the seven council members said they didn’t want to include in the plan a way for developers to request additional square footage for offices — at least in the near future. 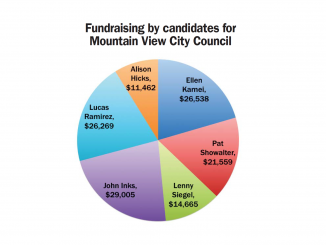 The council members were Margaret Abe-Koga, Lisa Matichak, Leonard Siegel and John McAlister. Google is looking for another 800,000 square feet of offices in addition to what would now be allowed in the plan. Adding more offices would bring in more workers and worsen the city’s housing shortage, Abe-Koga noted. “If you are really serious about the jobs housing imbalance … Why would we allow more office space? Because that would only exacerbate the imbalance,” she said. Van Belleghem said the strategy would be to start out by constructing projects on Landings, Huff and Shorebird, and then make sure measures implemented to reduce traffic were effective. 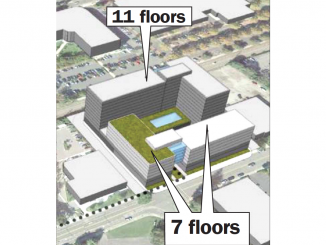 At that point, Google would ask for another 400,000 square feet of offices. The company would provide an environmental analysis of potential impacts of the additional growth. At a later date, Google would seek an extra 400,000 square feet for its Charleston South office building, he said. Other council members said they didn’t want to close the door on the possibility of additional offices. Including a process for considering more office space wouldn’t necessarily mean the council would approve such a proposal, only that the request would be evaluated, they noted. The council didn’t take a formal vote on the issue, but since a majority expressed opposition, a process for proposing additional offices won’t be included in the precise plan when it returns for what may be a final vote. That’s expected to happen next month. But another tense moment ensued when, after the council’s lengthy debate of the topic, Community Development Director Randy Tsuda said Google could still apply for additional offices through what’s known as the city’s gatekeeper process. That process is available for proposals city-wide and won’t be precluded in North Bayshore, even though it’s not mentioned in that area’s specific plan, he said. Schools were also a focus of the council’s discussion. Council members said they want to see schools, and elementary schools in particular, included in new development in the North Bayshore area, to help create a complete community and avoid traffic that would result from parents driving back and forth to schools outside of the plan area. Since many of the new housing units would be small, Van Belleghem said, the question is how many school children would be living at North Bayshore. 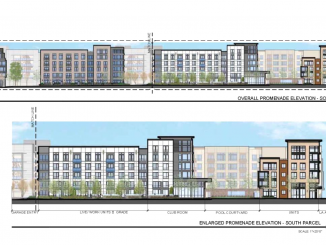 According to a draft environmental impact report for the North Bayshore precise plan, the 9,850 housing units would include 3,940 micro-units or studios; 2,955 one bedrooms; 1,970 two bedrooms and 985 three bedroom units. Council members are hoping some of the units will be for sale rather than for rent.